Butterflies reflect on life in Hull ahead of May exhibition. 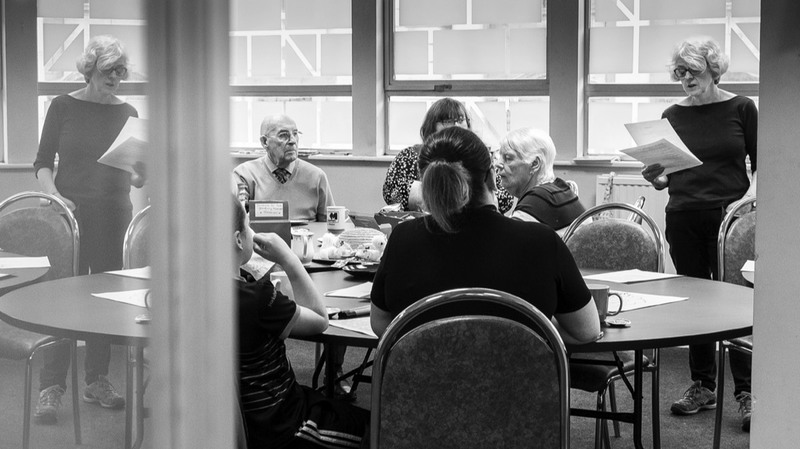 The second part of the year-long Butterflies exhibition is called Reflections and invites participants and observers to think about how the diagnosis of dementia has affected their lives and the lives of those around them. When we reflect on our lives we often highlight achievements, milestones, look for moments where our life has changed. The theme of change runs right through Reflections and became the drive behind the Thursday session with lead artist Frances. Using the method employed so successfully by poet John Killick who visited the group last year, Francis and Michelle shared a selection of poems with the group, talking about the themes within each one, and how they might relate to the themes of the Reflections strand. The poems came from various sources including butterflies members themselves with verse about personal experiences of Hope, memories of revolutionary styles in Fashion and the depiction of walking over a frozen Hull lake in Winter. Also included in the selection a few more well known writers, including the American poet Robert Frost. His ‘The Road Less Travelled’ is a particularly good example of a poem that uses reflecting on a life lived, to explore choices made and the inescapable nature of change. After receiving a diagnosis of dementia a person can experience a lot of changes, some that can actually help them live their lives better. With a diagnosis it is far easier to access support services and develop a care plan that meets all the different requirements. also having a diagnosis can help the family come to terms with what is happening to their loved one. The moments after diagnosis can also be a very scary place where someone may feel lost and helpless. It is up to all the different services to work together to making this transition period as painless as possible. Using familiar landmarks in the city centre the group reflected on how the landscape had affected their lives, provoking memories around local foodstuffs, the great pattie debate, the best fish for fish and chips and the inclusion or not of chip spice. Almost causing a diplomatic incident the wrong rugby team was assigned a challenge cup victory ( by yours truly) provoking outrage throughout the rugby fans in the room. Woe be tide the one who mixes up the Black and Whites for the Robins. Hull people always come back - typified by Frances’ own story she came to Hull for a year and is still here 25 years later. The group also enjoyed learning the word truculent though decided that ‘narky’ was more our style. Taking the theme of reflections and using a hand mirror template the butterflies set to decorating the mirrors and finding some way to represent themselves or their experience in the glass. Other group members used images and recreated, traced with a lightbox’ or drew from memory places and ideas that had significance to them. A bluebell forest picture conjures up the story of the first time seeing a blanket of blue blooms as a child: remembering just how beautiful and special that first time was. All the responses were colourful and varied and will be used to make up the evolving display at the forthcoming exhibition in May.